This is another darling Vintage Line Art Drawing from a 1940′s Children’s Tracing and Coloring Book! Shown above is a cute Picnic Basket, complete with food inside! It looks like there is a sandwich, some cookies and Apple and a tablecloth to sit on. Everything that you need for the perfect Summer picnic! 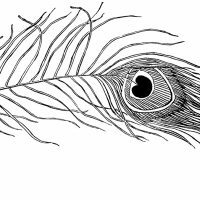 This would be a fun one for the kids to color in of course, but I think it would also work nicely for embroidery projects, or cardmaking, or even scrapbooking! I hope you have fun with it! You might also like the Shovel and Pail drawing from that same book, you can find it Here. Vintage Mausoleum Clip Art – Spooky! 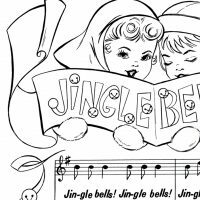 Printable Christmas Coloring Page – Jingle Bells Free Peacock Feather Image – Fabulous! !